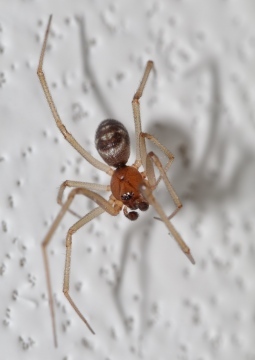 This looks like Steatoda nobilis, the so-called 'noble false widow', the spider which the media make such an unjustified fuss about. It has been frequent in the southern coastal counties of England for a great many years, without causing any problems. It is nowadays frequent in many areas of southern England, including the London area. The media frenzy caused by this spider is unwarranted. 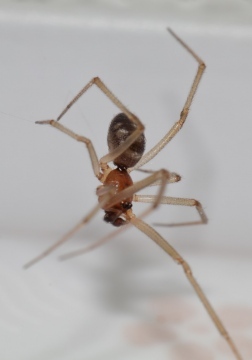 There are a number of other 'false widows' in Britain, some which are native or have been in the country for centuries, so there is a lot of misinformation about these spiders. 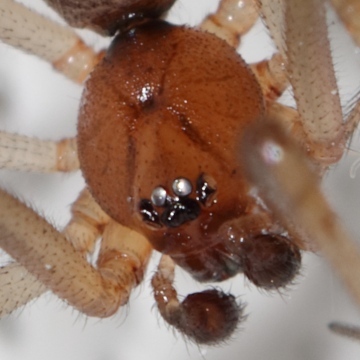 Steatoda nobilis spiders are unobtrusive, have no interest in attacking humans and would only bite if they were put into a position where they do so as a defensive reaction. Honey bees and social wasps pose a far greater risk. Found this amazing looking chap in my girlfriends Kitchen and was wondering what type of spider he was? 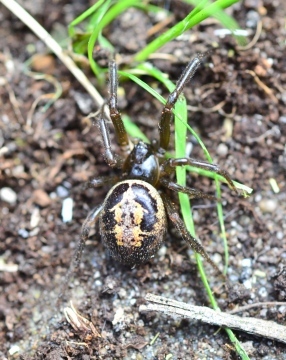 No, this looks like Steatoda grossa, a spider previously most common in the southwest and occurring more sparingly eastwards and northwards, but in recent years it has also become widespread elsewhere and in the south-east (see Steatoda grossa). The adult females often have no obvious markings. I caught this spider took this photo and returned it to the wild on the 14/05/2016 whilst weeding in the back garden. 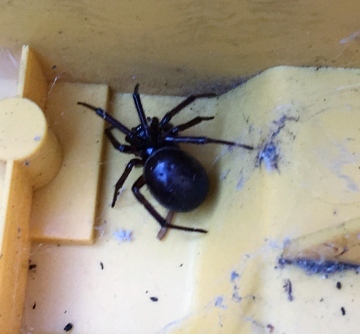 I think it might be a false widow (Steatoda nobilis?) but wanted to confirm the identification. We spotted this spider this afternoon (15/05/2016) while cleaning/weeding in the back garden. 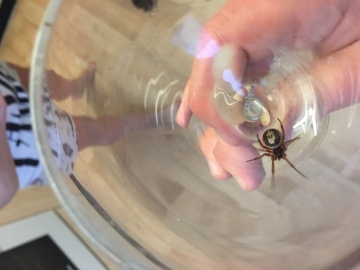 I think it might be a false widow (Steatoda nobilis?) but wanted to confirm the identification. It was seen at TL8437164476 in Bury St. Edmunds, Suffolk. Any help very much appreciated! You can upload pictures from the picture upload link once logged-on, and these are then available to use in a post to the forum. You can also submit records of raft spiders from links on the home page, Index or Species surveys and Raft spiders pages. I think I saw a Raft Spider today - does this need to be recorded? On heathland just off the Wareham Bypass A351, Dorset Grid Reference SY923854 Friday 13th May 2016 I do have photographs but not sure how to upload them with this query. 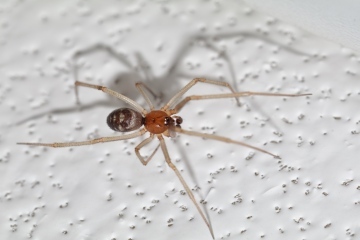 Please note that we ask, immediately above the foruim post, "IF YOU WANT HELP WITH IDENTIFICATION, PLEASE PROVIDE A FULL POSTCODE OR GRID REFERENCE AND DATE of the record so that it can be added to the recording scheme"
Steatoda grossa in the bathroom? Spotted this one last night on the ceiling of my bathroom in Harborne, Birmingham. I'm fairly sure it's a male Steatoda grossa, is that correct? EDIT: Grid refs now in picture locations. 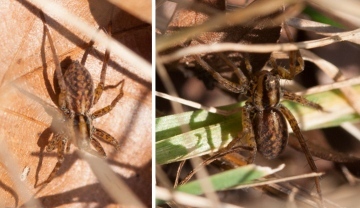 Both Pardosa wolf spider species, but reliable identification to species needs microscopical examination of adult male palp / female epigyne. Another Hunting spider I saw basking on a leaf on 24th February this year (2016). It was a bright day. Spider 7 - 10mm from memory. Location, scrubby edge of path just outside a heavily wooded section along Devil's Dyke, Cambridgeshire. 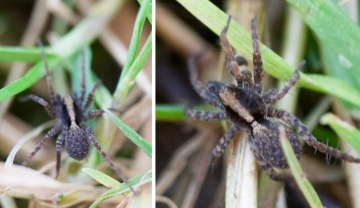 I'm pretty sure it's Lycosidae but not 100% sure as I really am a beginner at spider ID! Any help gratefully received! I saw this spider basking on 24th February this year (2016). It was a bright day. Spider 7 - 10mm from memory. Location, scrubby edge of path just outside a heavily wooded section along Devil's Dyke, Cambridgeshire. I think it's Pardosa sp but not 100% sure. Any help gratefully received!